WTH kind of combination is fish and bananas? Guys, trust me here. Do you really think I’d steer you wrong with a recipe? Let me tell you a little something about Fish with Bananas. This was THE recipe (okay, maybe one of many) that I absolutely REFUSED to taste when I was a little kiddo. This very special dish only came out on certain occasions (I mostly remember it being my mom’s request on my parents’ anniversary) and I would politely notify my parents that I would make myself macaroni and cheese that evening. My parents didn’t care too much, because that meant more for them. Once I “grew up” (as did my palate) and I finally caved in and tried the dish, I was kicking myself for having missed out on it for all those years. 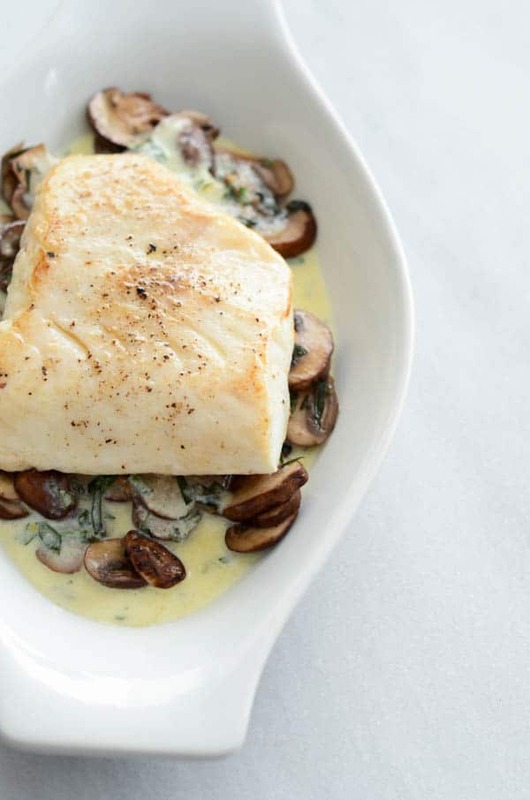 Then we gently layer on our (very lightly) seared fish (sea bass, halibut, black cod…the possibilities are endless) before drizzling on more of the above-mentioned foodgasm-inducing sauce. Our final layer before the oven is a lightly caramelized banana split in half lengthwise, gracing either side of our filet o’ fish. You still with me? The hard part is over. 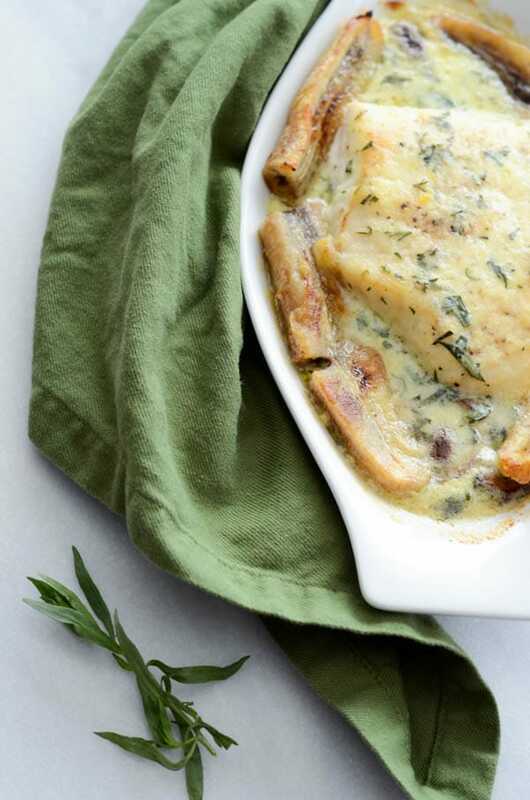 We simply pop our au gratin dishes into the oven and let them cook and simmer and become even more delicious until our creamy sauce is bubbly and golden. We pull the dishes out and devour them as soon as they are just cool enough to eat without burning the roofs of our mouth off. Fish with Bananas is best enjoyed as quickly as possible, so don’t let these sit around and get cold. So what do you say? Have I convinced you yet? Are you ready to be adventurous and stop missing out on this amazing combo? If you make this, please be sure to let me know! I’d love to hear your thoughts. I hope you enjoy Fish with Bananas as much as I do! 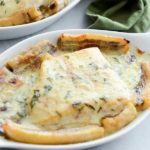 The delicious, unexpected combination of fish and bananas make this the perfect "special occasion" dish. Heat butter in a medium sauté pan until melted. Add mushrooms at medium-high heat. Add tarragon. 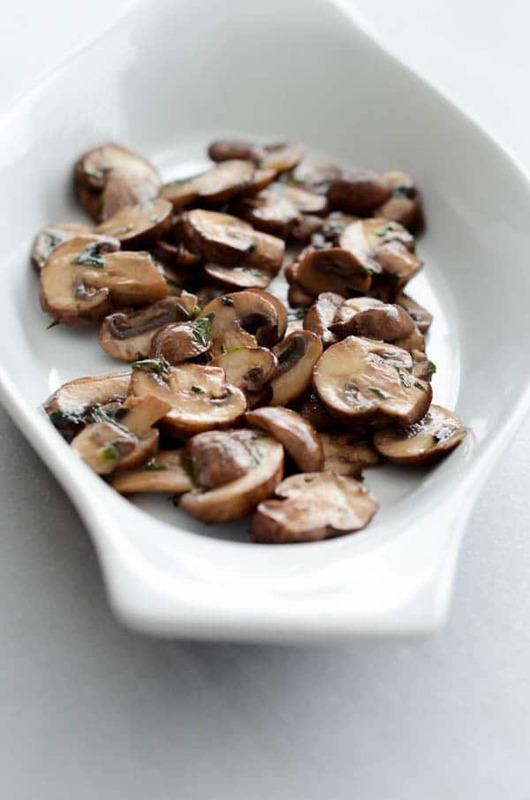 Stir to coat and sauté until the majority of the liquid has been cooked out of the mushrooms. Add salt & pepper as needed. 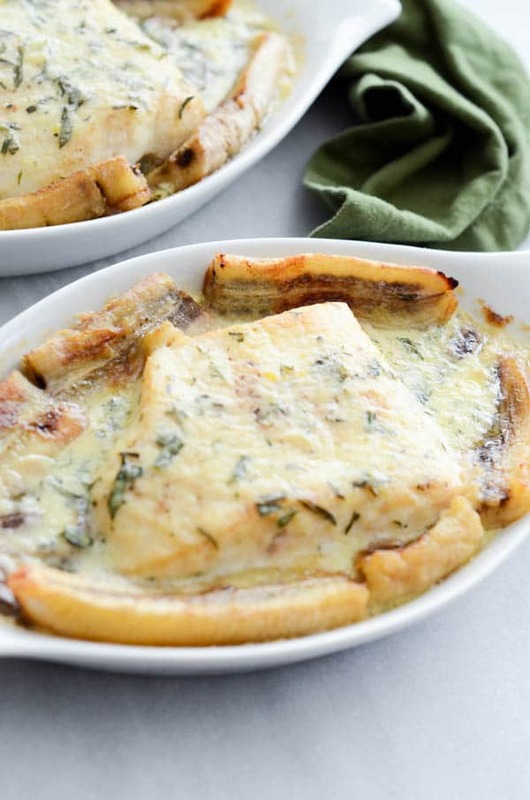 Remove from heat and divide mushrooms amongst the two au gratin dishes. In a medium saucepan over medium heat, melt 1 tablespoon butter. Once butter is melted, add shallots. Saute slightly until they are fragrant and start to become translucent, about 3 minutes. Add white wine. Turn heat to low and simmer. In a separate, small saucepan, heat egg yolks, stirring constantly until they become thick. Once thickened, add 1 tablespoon butter and orange juice. Stir to combine, then add to white wine-shallot mixture. Add whipping cream and tarragon and stir to combine. Remove sauce from heat and put in a blender. Blend until combined and whipping cream becomes frothy. Pour back into saucepan and simmer on low heat. 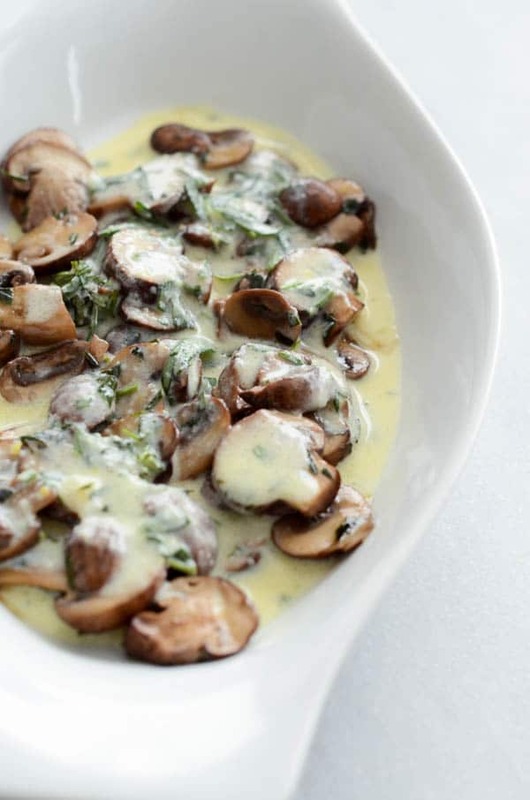 Once rewarmed, drizzle half of the sauce over the mushrooms in the two au gratin dishes. Season the two pieces of fish with salt & pepper. 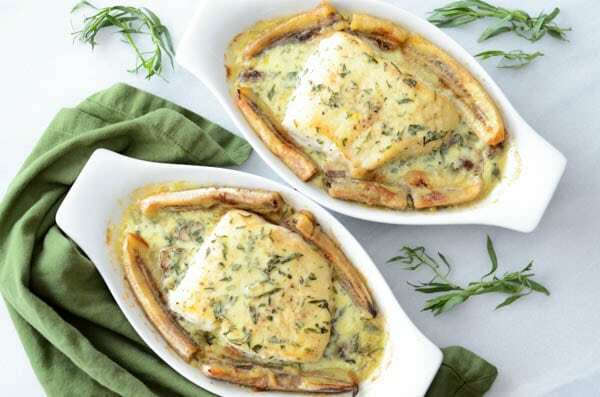 Place one piece of fish over the mushrooms and sauce on each of the au gratin dishes. 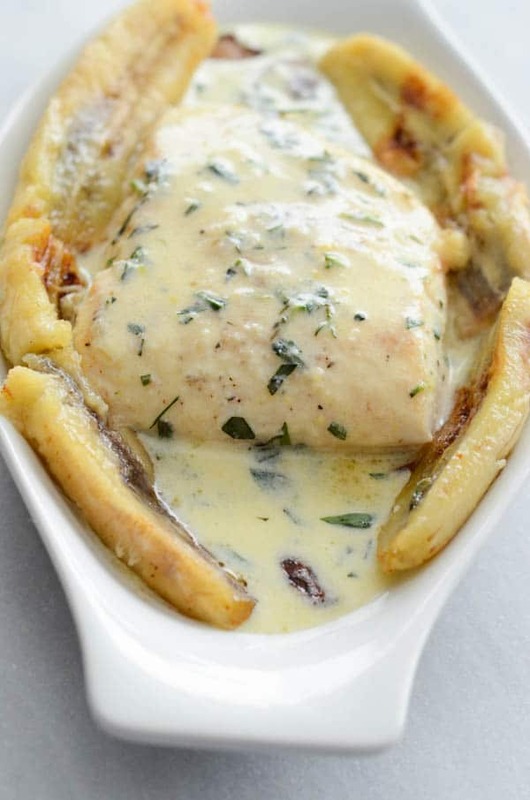 Drizzle each piece of fish with the remaining sauce. Heat butter in a small sauté pan over medium-high heat. Once butter is melted and pan is hot, add slices of banana. Caramelize until lightly golden (about 1-2 minutes each side.) 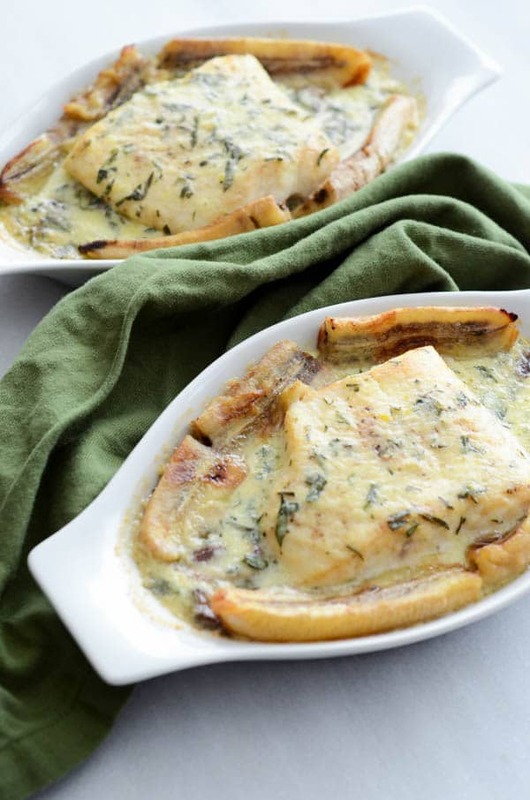 Remove bananas from pan and place slices on top of the sauced fish in the au gratin dishes. 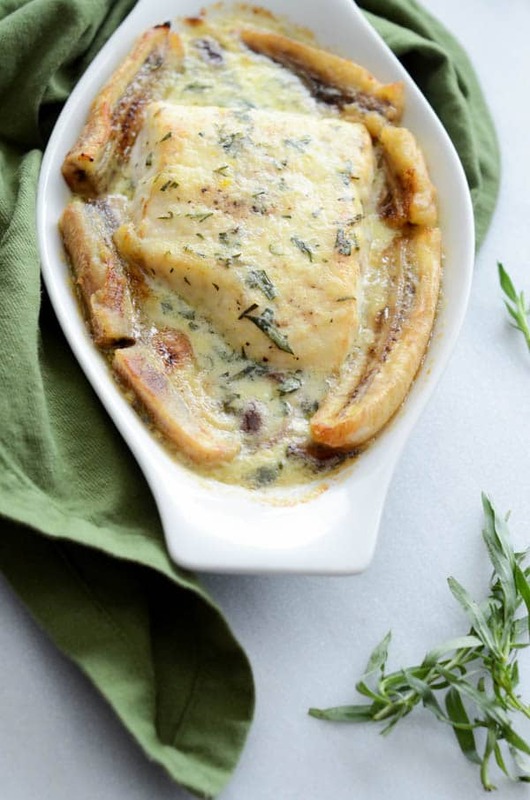 Place au gratin dishes in preheated 425-degree oven. Bake for about 18 minutes or until sauce is bubbly and golden. Remove from oven and let cool slightly before eating. 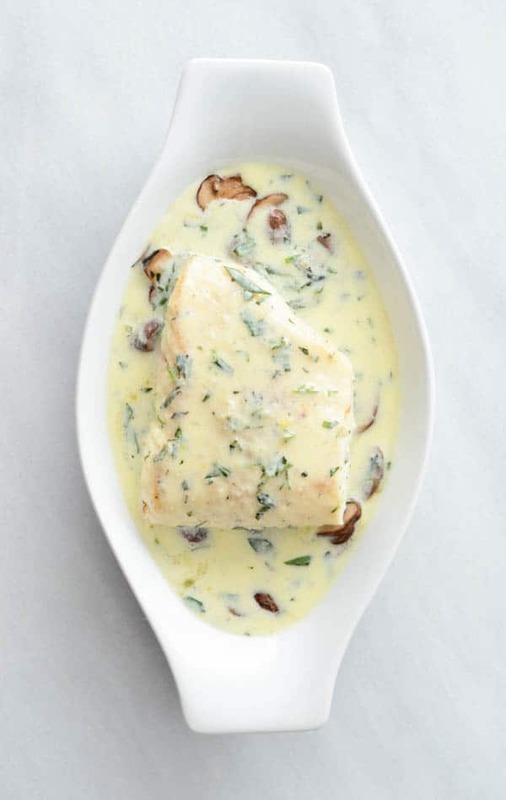 Wine Pairing Suggestion: This dish is begging for an oaked Chardonnay, which will pair perfectly with the white fish and cream sauce. Bonus if you can find an oaked Chardonnay with a hit of acidity, as it will help cut through the richness. I highly recommend the Alpha Omega Chardonnay.